The terms “bear” and “raptor” are not things you typically think of as house friendly. But in these two cases, we are talking about different animals altogether — namely Bear Clips and Raptor Synthetic Underlayments. 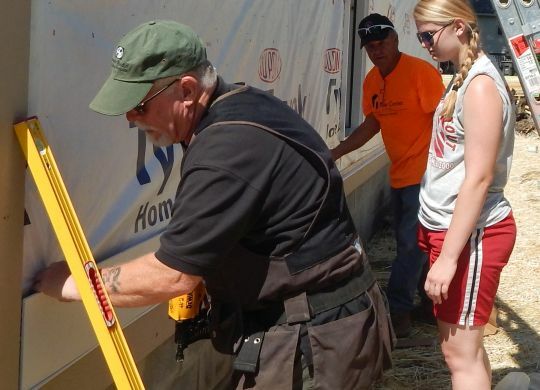 Bear Clips, invented by Mike Walda, help workers and volunteers who install siding such as Hardie Board to keep it even and properly spaced throughout the entire process while making the installation easier and faster. Raptor Underlayments, created by John Reese, are much lighter than the felt that once was the standard underlayment beneath shingles and are safer and easier to roll out as they come in swaths up to 10 feet wide. 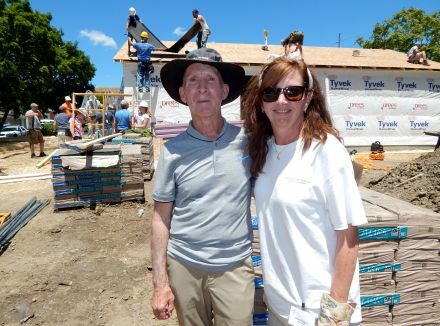 The Fuller Center had the pleasure of welcoming both of these wonderful men — each of whom donated their particular materials for the 2017 Millard Fuller Legacy Build — to work sites in Indianapolis this week. Each took a moment to speak with us about their work. As the inventor, manufacturer and distributor of Bear Clips, Mike Walda is about as much of an expert as you can possibly find when it comes to using the clips to properly install fiber cement siding such as that being used on the five new homes at this year’s Millard Fuller Legacy Build in Indianapolis. To that extent, he has been on site all week to show volunteers how easy Bear Clips are to use. Because the clips are manufactured with such specificity and accuracy, they can be placed atop each plank to hold the next plank with a J-hook at exactly the correct level. After nailing each board, clips are added to make way for the next board — and so on throughout the process. Walda became acquainted with The Fuller Center’s affordable housing ministry while working on a project with A.J. Jewell, who leads the Central Florida Fuller Center for Housing in the Orlando area. Jewell connected him with The Fuller Center’s Brenda Barton, whom Walda told he would like to be a part of this project. “It’s all about helping people and giving back and making it easy,” he said. In addition to manufacturing Bear Clips, he also makes Bear Skins, which is joint flashing that goes where two horizontal planks meet. Again, simplicity is the name of the game for Bear Skins, which he also donated to the build. The motivation that led John Reese to create Raptor Synthetic Underlayment originally had nothing to do with making an easier-to-use product to go between wood decking and shingles. He was simply trying to keep people from falling off of roofs as they worked. Halfway around the world, a man in India took notice of these videos when Reese said in one that synthetic underlayments might be safer but were too expensive. Raptor rolls come in sizes up to 10 feet wide — much wider than typical felt rolls — and can be printed with almost any design their customers desire. For the Raptor Underlayment that Reese donated for use at the Legacy Build, he was happy to oblige the host Fuller Center of Central Indiana’s wish to have American flags printed upon them. It has many selling points, but for Reese the biggest selling point always has been safety. His product is not only safer but it also speeds up the roofing process — not to mention that even his 10-foot-wide rolls weigh less than a single roll of felt.